This is an article about the non-vascular plants. The name Hornwort is also often applied to an aquatic plant Ceratophyllum demersum in the family Ceratophyllaceae. 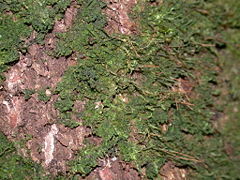 Hornwort is the common name for any of the bryophytes, or non-vascular land plants, comprising the division Anthocerotophyta. The common name refers to the elongated horn-like structure, which is the short-lived sporophyte phase of the life cycle. The flattened, green plant body of a hornwort is the persistent, photosynthetic gametophyte phase. 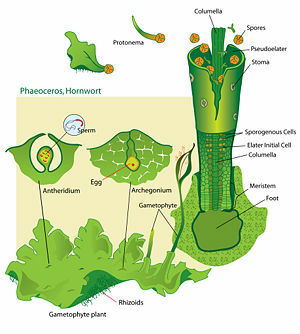 As an organism that undergoes a life cycle known as alternation of generations, hornworts are characterized by a reproductive cycle consisting of one of two separate, free-living organisms: the gametophyte, which is a multicellular structure that is genetically haploid, and a sporophyte, which is genetically diploid. As bryophytes, along with mosses and liverworts, hornworts are members of the land plants (embryophytes) that are non-vascular, meaning that they lack or have poorly developed water- and food-conducting strands in their roots (xylem and phloem). They do not have roots, only filamentous rhizoids. Originally, the three groups—mosses (division Bryophyta), hornworts (division Anthocerotophyta), and liverworts (division Marchantiophyta)—were brought together as the three classes or three phyla within the division Bryophyta. However, they now are placed in separate divisions, while grouped together as bryophytes because of their similarity as non-vascular, land plants. Algae, which are aquatic plants, are also non-vascular. Hornworts may be found worldwide growing primarily in places that are damp or humid. Some species grow in large numbers as tiny weeds in the soil of gardens and cultivated fields. Large tropical and sub-tropical species of Dendroceros may be found growing on the bark of trees. Hornworts are important components of their ecosystems. They occupy a unique niche, helping to pioneer areas, stabilizing soil, and playing a role in nutrient recycling. They also serve as indicators of pollution. Furthermore, they offer aesthetic value with their intricacy and beauty, and their unique life cycle adds to the wonder of nature for people. Thus, hornworts exhibit bi-level functionality as they perform an important role in the ecosystem and enhance the human experience, while also advancing their own needs for survival and reproduction. As bryophytes, hornworts have tissues and enclosed reproductive systems, but they reproduce through spores without either flowering or producing seeds. The ecologically persistent, photosynthetic phase of the life cycle is the haploid, gametophyte generation rather than the diploid sporophyte. Bryophyte sporophytes are very short-lived. They are attached to and nutritionally dependent on their gametophytes, and they consist of only an unbranched stalk, or seta, and a single, terminal sporangium (Crandall-Stotler and Stotler 2000; Crandall-Stotler et al. 2005). Bryophytes are typically small, herbaceous plants, growing closely packed in mats or cushions on rocks or soil, or as epiphytes on the trunks of trees. The plant body of a hornwort—the haploid gametophyte stage—usually grows as a thin rosette or ribbon-like thallus between one and five centimeters in diameter. Each cell of the thallus usually contains just one chloroplast per cell. In most species, this chloroplast is fused with other organelles to form a large pyrenoid that both manufactures and stores food. This particular feature is very unusual in land plants, but is common among algae. The horn-shaped sporophyte grows from an archegonium embedded deep in the gametophyte. Hornwort sporophytes are unusual in that the sporophyte grows upward from meristemic tissue near its base, instead of from meristemic tissue near its tip as in the common pattern of plant growth. Unlike liverworts (Marchantiophyta), most hornworts have true stomata on the sporophyte as mosses do. The exceptions are the genera Notothylas and Megaceros, which do not have stomata. When the sporophyte is mature, it has a multicellular outer layer, a central rod-like columella running up the center, and a layer of tissue in between that produces spores and pseudo-elaters. 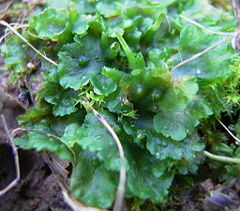 The pseudo-elaters are multi-cellular, unlike the elaters of liverworts. They have helical thickenings that change shape in response to drying out, twisting in ways that help to disperse the spores. Hornwort spores are relatively large for bryophytes, measuring between 30 and 80 µm in diameter or more. The spores are polar (i.e., having two distinctly different sides or ends) usually with a Y-shaped tri-radiate ridge on the proximal surface, and with a distal surface ornamented with bumps or spines. The life of a hornwort starts from a haploid spore. In most species, there is a single cell inside the spore, and a slender extension of this cell called the germ tube germinates from the proximal side of the spore. The tip of the germ tube divides to form an octant of cells, and the first rhizoid (structure that functions like a root) grows as an extension of the original germ cell. The tip continues to divide new cells, which produces a thalloid protonema. By contrast, species of the family Dendrocerotaceae may begin dividing within the spore, becoming multicellular and even photosynthetic before the spore germinates. In either case, the protonema is a transitory stage in the life of a hornwort. From the protonema grows the adult gametophyte, which is the persistent and independent stage in the life cycle. This stage, which usually grows as a thin rosette or ribbon-like thallus, may be a few centimeters in diameter and several layers of cells in thickness. The gametophyte may be green or yellow-green from the chlorophyll in its cells, or bluish-green when colonies of cyanobacteria grow inside the plant. Hornworts were traditionally considered a taxon within the Division Bryophyta, along with mosses and liverworts. However, it now appears that this group is paraphyletic, so the hornworts tend to be given their own division, called Anthocerotophyta. There is a single class of hornworts, called Anthocerotopsida, or traditionally Anthocerotae. This class includes a single order of hornworts, Anthocerotales, in this classification scheme. In some other classification schemes, a second order Notothyladales (containing only the genus Notothylas) is recognized because of the unique and unusual features present in that group. Among land plants, hornworts appear to be one of the oldest surviving lineages; cladistic analysis implies that the group originated prior to the Devonian, around the same time as the mosses and liverworts. There are only about 100 species known, but new species are still being discovered. The number and names of genera are a current matter of investigation, and several competing classification schemes have been published since 1988. ↑ R. E. Stotler and B. J. Candall-Stotler, "A checklist of the liverworts and hornworts of North America," The Bryologist 80 (1977): 405-428. Chopra, R. N. & P. K. Kumra, 1988. Biology of Bryophytes. New York: John Wiley & Sons. ISBN 0470213590. Duff, R. J., J. C. Villarreal, D. C. Cargill, and K. S. Renzaglia. 2007. Progress and challenges toward developing a phylogeny and classification of the hornworts. The Bryologist 110(2): 214-243. Grolle, R. 1983. Nomina generica Hepaticarum; references, types and synonymies. Acta Botanica Fennica 121: 1-62. Hasegawa, J. 1994. New classification of Anthocerotae. J. Hattori Bot. Lab 76: 21-34. Renzaglia, K. S. 1978. A comparative morphology and developmental anatomy of the Anthocerotophyta. J. Hattori Bot. Lab 44: 31-90. Renzaglia, K. S., and K. C. Vaughn. 2000. Anatomy, development, and classification of hornworts. Pages 1-20 in A. J. Shaw and B. Goffinet (eds. ), Bryophyte Biology. Cambridge: Cambridge University Press. ISBN 0521660971. Schuster, R. M. 1992. The Hepaticae and Anthocerotae of North America, East of the Hundredth Meridian, Volume 6. Chicago: Field Museum of Natural History. ISBN 0914868217. Shaw, A. J., and B. Goffinet (eds.). 2000. Bryophyte Biology. Cambridge: Cambridge University Press. ISBN 0521660971. Stotler, R. E., and B. J. Candall-Stotler. 1977. A checklist of the liverworts and hornworts of North America. The Bryologist 80: 405-428. This page was last modified on 14 January 2018, at 15:57.